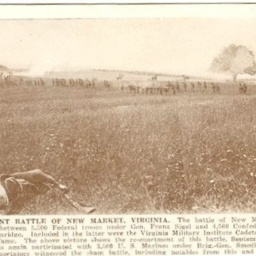 Postcard showing a reenactment of the Battle of New Market by US Marines and Virginia Military Institute Cadets on September 20 1923. Includes a description of the battle and note that the re-enactment attracted 150,000 spectators. .